JACKSON Robert Brook . 179th regiment. 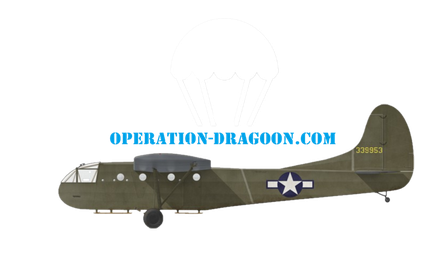 45th infantry Division - Site de operationdragoon ! 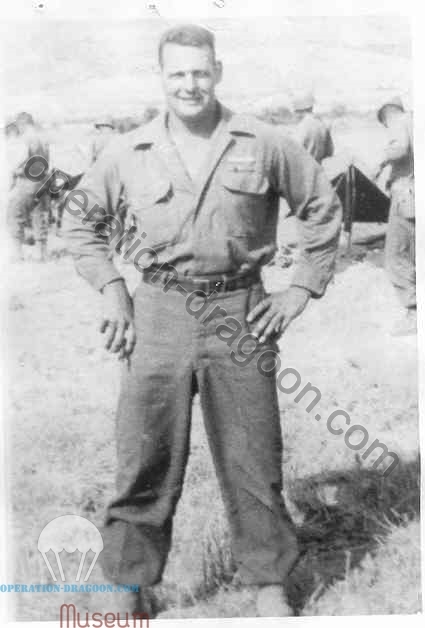 Bob Jackson enlisted in the US Army February 1942 in NYC and was assigned to the 45th Division as a replacement. He was in the 179th Regiment, Company B. 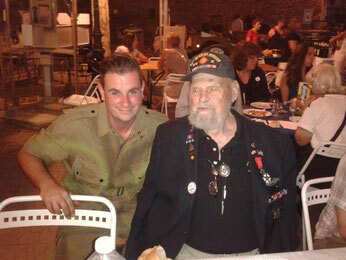 He was part of the amphibious landings at Sicily in July 1943, Salerno in Sept 1943, and Anzio in Jan 1944. He was wounded on June 1st, 1944, at Genzano during the breakout. He was in the hospital in Naples for a week or so and then rejoined the 179th, Company D in time for the invasion of Southern France. With the 45th Division, he landed at St. Maxine on August 15th, 1944, and they made their way up through Le Thoronet . Cotignac. Barjols . Grenoble, Bourg, Besancon, Vesoul and Epinal. On Jan 1, 1945, at Wingen, he was among some 96 enlisted men and officers taken and held as prisoners by the elite 12th Mountain Regiment of the 6th SS Mountain Division for several days. 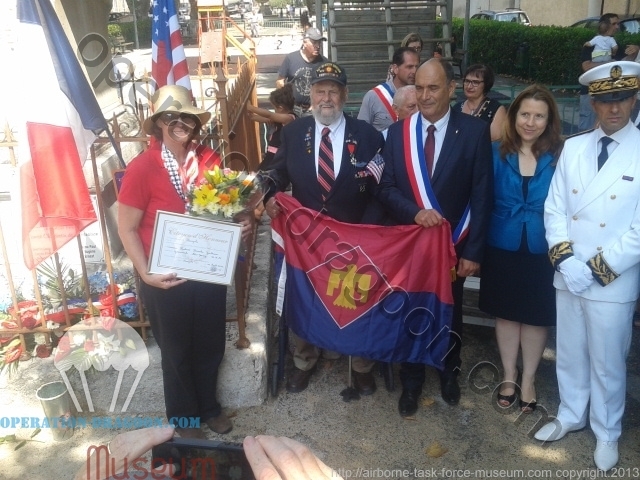 Liberated by the 276th Regiment of the 70th Division, he and his fellow soldiers rejoined the 179th. They entered Germany with the 5th Army, taking Aschaffenburg, Nuremberg, and Munich. He was assigned to guard duty at Dachau Concentration Camp for several weeks as the war drew to a close. He earned the Combat Infantryman’s Badge (511 days combat), and was awarded the Purple Heart and the Bronze Star. His proudest moment was standing Honor Guard for Gen. Patton. Bob came back to Europe in 2009 and became a very good friends. 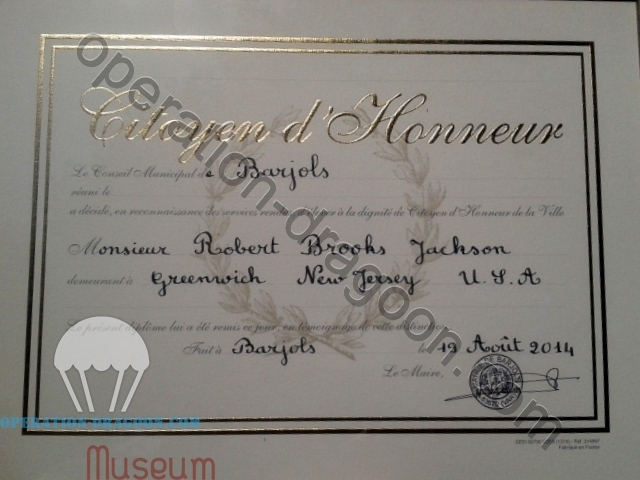 He was welcomed in all the villages he liberated and in 2014th, he was awarded by the Mayor of the town of Barjols as Honnor Citizen. Bob left us in July 2018, few day before his 98th birthday. Thankyou Bob, you will never be forgoten, thank you Wendy & Chuck for the wonderfull time we all spend together.